Beginning Monday, Juicy Stakes will give you free spins on its new Jumbo Joker slot. Well-known for its busy poker room, Juicy Stakes also has a collection of casino games from Lucktap, Worldmatch and Betsoft. 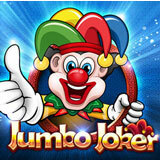 Jumbo Joker, with its high stakes Jumbo Meter reel, is the newest from Betsoft. Jumbo Joker, Juicy Stakes’ Game of the Week next week, is a modern version of classic pub-style fruitee slot machines with cherries, lemons and bars on its reels. Its unique Jumbo Meter reels above the main reels give players a chance to place higher wagers and win higher pay-outs. The Jumbo Meter mode also offers a double or nothing option whenever a win of at least 20 coins occurs on the bottom reels. Unique high-stakes Jumbo Meter reel gives players a chance to place higher wagers and win higher pay-outs. Next week, depositing players get 10 free spins to try the new game. Valid November 6-12, 2017 only. Jumbo Joker has five fixed paylines. Players set their bet by choosing a coin value (from .02 to 1 each) and the number of coins to bet per line. The max bet on the lower reels is 10 coins but on the Jumbo Meter reels players can bet up to 200 coins per spin. Free spins on Jumbo Joker are just available for a week but the November Casino Quest continues to give bonuses to Blackjack and video poker players until the end of the month. All month long, the November Casino Quest will pay $100 to all video poker players that hit one pair, ten Straights and five Full Houses. Juicy Stakes welcomes players from all over the world. New players are offered a 200% Welcome Bonus, 100 free lines on any casino game, and a free ticket to a New Player tournament in its popular online poker room on the Horizon Poker Network.